We know visiting a new church for the first time can be uncomfortable so we want to help make your first experience at LifePoint Crossing a great one! Worship here is casual and contemporary, and you’re welcome to come as you are. We offer two identical services at 9:00 and 10:30 every Sunday morning, as well as several smaller gatherings and groups during the week. We are excited to connect with you and your family! From I-70, you'll take the Woods Chapel /RD Mize exit heading north. We're located on the west side of the road, about a half mile from the interstate, just before you pass Paul Kinder Middle School. In addition to our brick church building, you'll see a small house near the road---that's our LifeHouse where our staff has offices and some small groups meet during the week. In total, our services are about 60 minutes in length. We begin with the worship team leading us in music. Song lyrics are projected onto the screen so you can sing along and engage with worship however you feel comfortable. After about 3 songs, Pastor Dennis will share an encouraging message to help us grow in our relationship with Jesus.  Sundays at LifePoint Crossing are fun and relaxed. Come as you are and expect to feel welcomed as our guest, though we certainly won't make you stand up during the service or call attention to you. Before heading into our worship center, grab a cup of coffee and a donut in the welcome center if you’d like. That’s also where you’ll find our Children’s Check-in area and Connection Desk information center. Then, head into the service prepared to listen, grow, and connect. Children are a big part of our focus on Sunday mornings. We’re passionate about keeping them safe and helping them grow. We offer nursery services for little ones up to two years old and kids' classes for children through fifth grade. Our LifePoint youth (grades 6 through 12) meet during the 9:00 service. Safety is a top priority, and you will need to fill out a brief form for your child on their first visit. Each child will be electronically checked into our system with an ID number matched to their parent for security and ease of pick-up at the end of each service. Check-in begins 15 minutes prior to each service. Our team will direct you to the correct room for your child and is happy to answer any questions you have to make sure that your family has a great experience. We want your child to enjoy their class, make new friends, and learn more about Jesus. Ready to visit us? We can't wait to meet you in person. Simply fill out the form below and we'll make sure to save you a seat (and your favorite donut!) for your first visit. We are here to love God, love each other, and serve the world through a growing relationship to Jesus Christ. Copyright 2019, LifePoint Crossing. All Rights Reserved.